Persistent monopoly pricing is generally thought to be bad because, among other things, it reduces the potential gains from trade. There are circumstances, however, under which, if only competitive pricing is permitted, suppliers will not supply a good and potential gains from trade will be lost. Under these circumstances, consumers may actually be better off permitting monopoly or having a government-regulated price that permits suppliers to make non-negative profits. This Demonstration provides a simple model showing these possibilities. Competition law, including antitrust law, intellectual property law, and other areas of law, attempts to distinguish situations of harmful monopoly from beneficial monopoly. The question for policymakers and lawmakers is under which circumstances government can do this accurately enough to do more good than harm, given the tendency for monopolies to break down or fade in the long run. Snapshot 1: The traditional picture of monopoly in which the monopolist sets price above the competitive equilibrium and thus sells a quantity less than the competitive equilibrium amount. 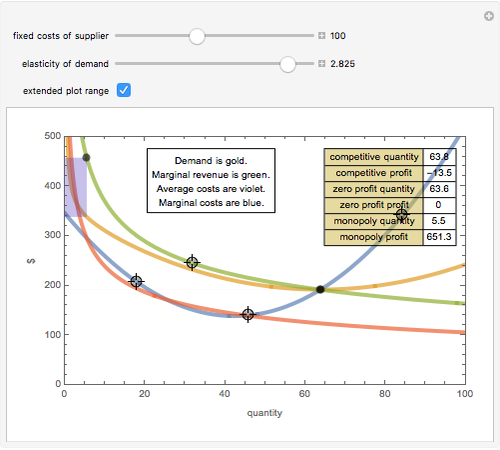 Snapshot 2: A low elasticity of demand increases monopoly profits (the blueish-green colored area). Snapshot 3: A setting in which sellers would make zero economic profit in a competitive market but could make money if they had a monopoly. 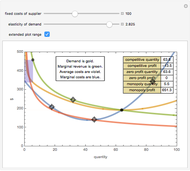 The user can control the marginal cost curve by moving about three "locators". Mathematica computes the parabola that fits these three points. 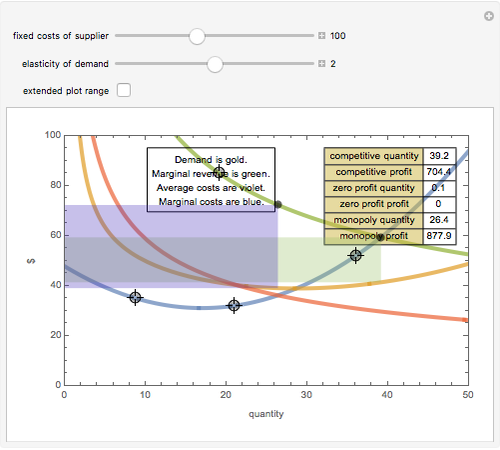 It then integrates the resulting quadratic and relies on user-specified fixed costs to compute an average cost curve. 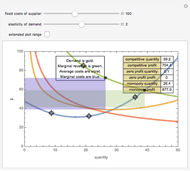 The user can control the demand curve by dragging a locator that sets one point on the demand curve and then specifying a constant elasticity of demand using a slider. Two rectangles are created. 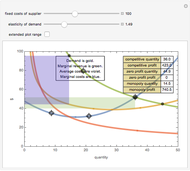 One shows the profit or loss the supplier would make in a competitive market. This rectangle is colored light green (gain) or light red (loss). 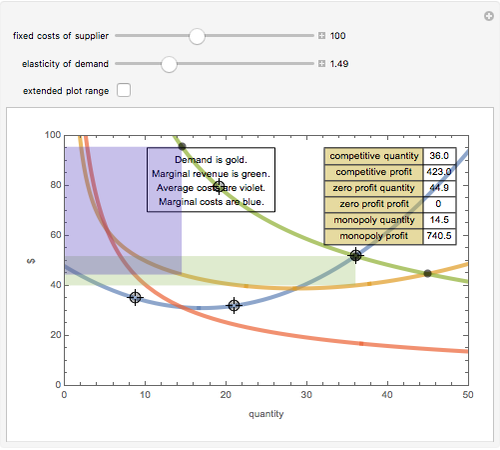 The second shows the profit or loss the supplier would make if set price as a monopolist. This rectangle is colored violet for a gain or red for a loss. Seth J. Chandler "Monopoly and Natural Monopoly"